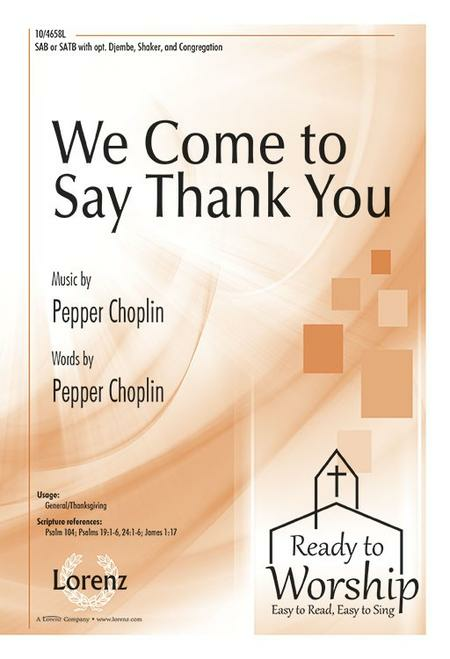 This winning Pepper Choplin anthem is flexibly voiced, easy and enjoyable to sing, and wonderfully enthusiastic in its expression of gratitude to our loving God. For all You've done we say, "Thank You, thank You today for all the blessings You send our way.". This is a fun, rhythmic song for Thanksgiving. It is something unique which is a nice change from other Thanksgiving anthems. This is easy to put together and the choir really enjoyed singing it! Good, energetic piece for Thanksgiving. practiced the 'congregation' portion about 3 times. We practiced the entire song twice on the morning of performance. With 'congregation' portion contained within the song several times, everybody sang on those sections. A few children did the descant with the sopranos. Many people commented favorably for the performance. The church secretary reported that people visiting the office through the week told her how wonderful the song was. I am a moderate pianist and enjoyed playing this lively tune. We plan to perform this again at Thanksgiving. The song was easy to learn, easy to sing,moderate to play. Listening to your audio was very helpful. We are a smaller choir, 20 in number. The upbeat feel is great for this group and being able to add the congregation is a plus. 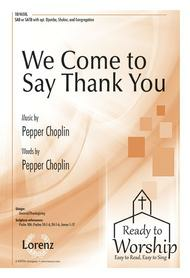 It is not difficult to learn and gives our singers time to really celebrate our Thanks with this song.